Making houses is easy, but making it a home is much more difficult and tedious. It is only dedicated and loving wives that can do it. We shifted into our new house almost a year ago, eleven months to be exact, but add ons continues. One of the recent add ons was an oven we had been wanting for long. And the moment it arrived, the cooking instinct of my wife took a new turn. She started off with mouth watering pizzas and cakes (unfortunately I could not preserve what came out of the oven), and latest was her grilled chicken. 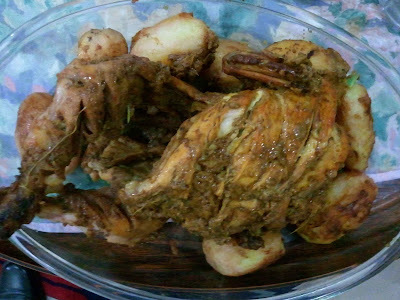 So yesterday I went and bought chicken for grilling and it was at night that the preparations started for its grilling. The marination and its refrigeration commenced in the evening and finally it was time to skewer it in the turn-strip and place it inside the oven. 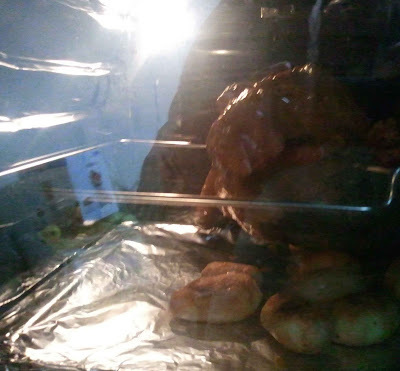 Then we all watched it slowly moving in the feint oven light as seen above. I shot the chicken in the oven by my cell phone and waited for it to be roasted and served. Finally it was time and there it came out - steamy and sizzling hot with its beautiful aroma that made it simply irresistible. But before it could vanish into our hungry tummies, I just had the time to snap it when it was being trollied into the dinning room. Thereafter, it was only bones in our plates as it was devoured instantly, served with hot brown baked potatoes.